A lot has happened in the last week. If you haven’t read my take on the presidential election, you can do so here. We are going to need you more than ever, and I want to show you what you accomplished just last month because you stood up for what’s right. Because of you, pinkwashing agricultural companies Bee Sweet Citrus and Wonderful Citrus felt the squeeze this Pinktober! 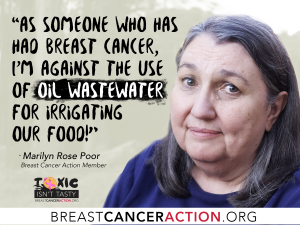 Your powerful voices, actions and stories helped us peel away their pink ribbons and expose the truth about how they grow their oranges with oil wastewater. You raised your voice so loudly, we got on Voice of America, The Stupid Cancer Show, and had our op-ed published in EcoWatch. And nine organizations—from environmental orgs to nurses’ groups—endorsed our campaign and joined our call to demand these pinkwashers take action to protect public health. Your stories reached more than 50,000 people on social media and blog posts by our Community Leader Alma Busby-Williams and our California Cancer Fracktivist Hannah Lyon reached thousands of others. Outrageously, instead of responding to your concerns by stopping their use of oil wastewater to irrigate their citrus, these companies continued to defend the indefensible.Thanks to our collective pressure, Bee Sweet and Wonderful had no choice but to publicly respond. Only one day after we launched this campaign, Bee Sweet was feeling so much heat that they shamefully blocked you from sending them letters. (But don’t worry—we delivered your letters to them.) They also felt enough pressure to write a statement that they publicized right on the homepage of their website. And Wonderful Citrus felt pressured to individually reply to each of your letters. But we’re not stopping now. Our “Toxic Isn’t Tasty” campaign is one piece of our work to protect us all from chemicals linked to increased breast cancer risk. Working to put public health before industry profit takes time and fierce activists like you.